"Native stereotypes still alive with many young people"
PORT DOVER - Sharon VanEvery wants children to stop thinking of today's Native people walking around in feather head dresses and living in teepees. Much of her discussion with Grade 3 students at St. Cecilia's separate school Wednesday involved dispelling those outdated stereotypes. VanEvery opened her presentation by asking the children what comes to mind when they think about Native people. She anticipated their responses - teepees, warriors, hunting, bears and skins. "A lot of people think about the way it used to be and not the way it is today," VanEvery told the students. "Our hair and skin may be a little bit darker and our eyes may look a little bit different and we may speak a little bit differently but we're just like anybody else." 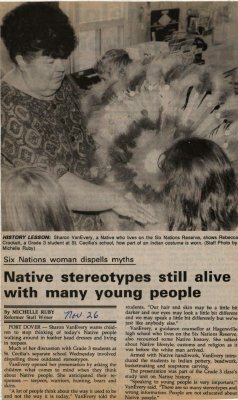 VanEvery, a guidance counsellor at Hagersville high school who lives on the Six Nations Reserve, also recounted some Native history. She talked about Native lifestyle, customs and religion as it was before the white man arrived. Armed with Native handiwork, VanEvery introduced the students to Indian pottery, beadwork, basketmaking and soapstone carving. The presentation was part of the Grade 3 class's study unit on Native history. "Speaking to young people is very important," VanEvery said. "There are so many stereotypes and wrong information. People are not educated about Native people." VanEvery, Sharon ; Crockett, Rebecca. Hagersville Secondary School ; St. Cecilia School.